Kesari Box Office collection: The film's worldwide box office collection is Rs 196.32 crore, the domestic box office collection stands at Rs 147.21 crore till now. Akshay Kumar starrer film Kesari is on the edge of making it into Rs 150 crore club. While Kesari's worldwide box office collection is Rs 196.32 crore, the domestic box office collection stands at Rs 147.21 crore till now. Kesari has a few more days left to make some more profit at the box office, until the much-hyped Dharma Production film Kalank hits the screen on April 17, mentioned trade analyst and movie critic Taran Adarsh in a tweet. #Kesari is steady... Has few more days to add to the total, till #Kalank arrives [on Wed]... [Week 3] Fri 1.65 cr, Sat 2.62 cr, Sun 3.23 cr, Mon 1.20 cr, Tue 1.02 cr, Wed 1.02 cr, Thu 95 lakhs. Total: â‚¹ 147.21 cr. India biz. According to boxofficeindia.com, Kesari earned an estimate of Rs 60-65 lakh on Friday. The drop was around 60% from last Friday, when the film collected Rs 1.65 crore. Kesari raked in Rs 105.86 crore in its first week, Rs 29.66 crore in week 2 and Rs 11.69 crore in week 3. 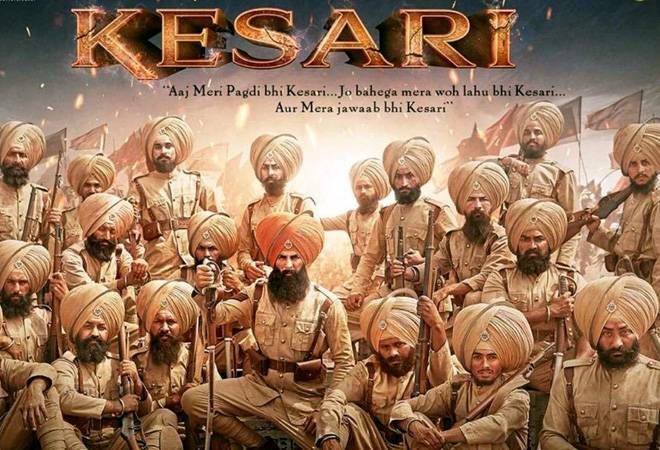 Kesari, which is based on 1897's Battle of Saragarhi, has been applauded by both critics and audience. The film narrates how 21 soldiers of the 36th Sikh Regiment of the British Indian Army put up a strong fight against 10,000 Afghan troops. Every year on 12th of September, the 4th Sikh Battalion of Indian Army commemorates the battle around as Saragarhi Day.